When Dr. Rob Lavinsky founded iRocks.com in the mid-1990's, it was simply an extension of The Arkenstone – the rock and mineral business he had been running since he was a young teenager. The site was the first of its kind, and quickly proved itself useful to collectors and enthusiasts worldwide. Since then, iRocks has set the world standard for collecting rocks and minerals online – and we're here, today, to offer some smart guidelines for building your collection online. 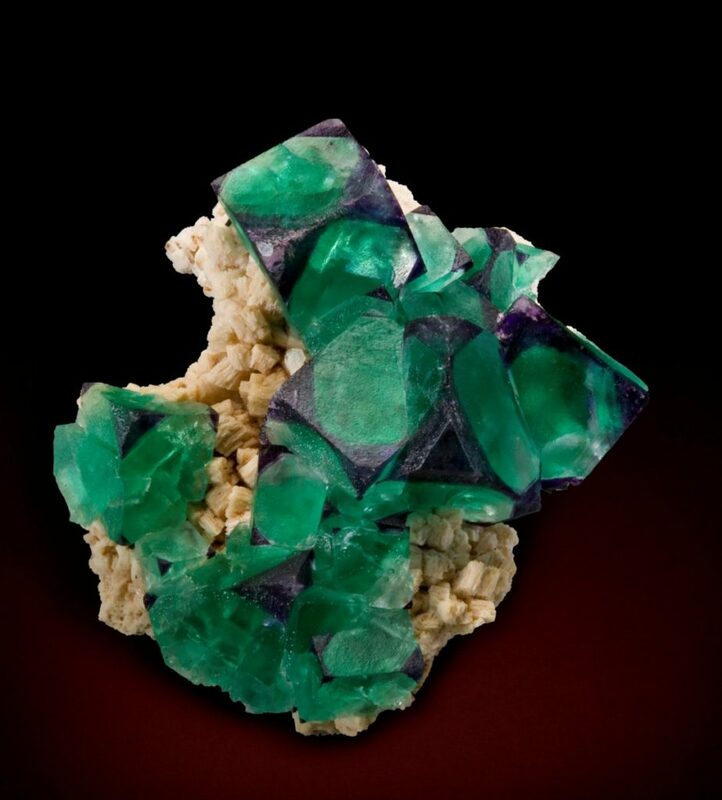 The Arkenstone's Jeff Starr has a soft spot for fluorite, like this specimen from Erongo, Namibia in his collection. Get specific. The internet is endless, so narrow your focus to the specimens which truly interest you. Whether you are focused on a specific species or locality, by narrowing the categories of your search, you'll receive a more manageable number of hits, and save yourself the time and effort of perusing specimens with low appeal to your collection. Not sure where to start looking? Check the themed galleries on iRocks for ideas on different areas to focus your collection! Here at The Arkenstone, we help collectors who have a wide range of collection themes; employee Jeff Starr focuses on fluorites (with some extra special outliers), while gallery manager Kevin Brown has an affinity for American minerals. Is blue your favorite color? Consider starting a collection of blue crystals! Do your homework. Use the power of the internet to research rocks and minerals online. Mindat is an excellent resource for exploring, and can provide insight into interesting properties and localities, as well as providing extensive images of most known minerals. Pay attention to provided photos. The best listings will feature several high-quality images, so you can view the specimen from all sides. The more detailed images provided, the better you'll be able to assess the quality and appearance of rocks and minerals online, and decide if each specimen meets your expectations. Take note of items included in images which might provide clues as to size and color, and ensure your monitor is properly calibrated to reflect color accurately. Multiple photos of this specimen from different angles help viewers learn more about the crystal. Read the descriptions closely. The best listings will include accurate and informative descriptions, including any important historical notes or relevant details. At the very least, EVERY listing should include the mineral name, locality or origin of the piece, and size – as well as noting any damage or negative features. If you have questions which are not answered by the images or descriptions, contact the seller, and allow them the opportunity to address your concerns before bidding for rocks and minerals online. Beware of forgeries and fakes. While the vast majority of auctioned rocks and minerals online are authentic, occasional trickery has been known to occur – generally in the form of man-made or “enhanced” specimens. Protect yourself from fraud by purchasing from well-known and established dealers and auction houses, and by educating yourself on identification of frauds and fakes. If a specimen has been repaired, potential customers should be warned upfront! Verify the seller's reputation. Reputable dealers stick around! Reviews for those who consistently offer high-quality rocks and minerals online can easily be located – they have buyers who will attest to their integrity, the quality of their service and merchandise, and their commitment to customer satisfaction. If you are unsure if a seller is legitimate, ask around – your collector colleagues and contacts will be sure to lend some insight. Account for shipping and postage. Shipping and handling costs can vary drastically, depending on the size and weight of each specimen and the distance of delivery. Pay attention to these charges when calculating the final cost of your purchases – and you'll avoid any costly surprises! If a shipping calculator is not provided, ask for an estimate of postage charges before confirming your sale – and avoid any sellers who do not respond, or provide a specific window for delivery. For more information regarding collecting rocks and minerals online, check out our other informative articles – or contact the experts at iRocks, today! Tourmaline: Most Colorful in the World?